Tomorrow I leave for Oklahoma - the photo was taken the last time I was there. 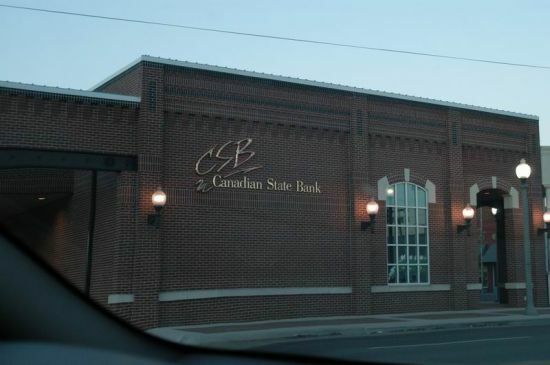 Each day we drove for several miles through very small towns to get to the telephone company where I was consulting - each day we would pass this bank - located in "Canadian County" which, being Canadian myself, we far too good to let pass without a photo. You will also notice that I have added the ability for members to add comments. Please feel free to add your thoughts to my diatribes - the system automatically adds a forum topic when someone does so, so people can discuss issues relating to an entry in the BLOG either here or in the forum. I´m not sure if I´ll be able to keep making posts when I´m in Oklahoma - I´ve been assured of having net access - so I should be ok - time will tell. Finally - I´m going to vent my frustrations - well, what good is a BLOG if I can´t vent from time to time! I´m a bit annoyed with my local newspaper. 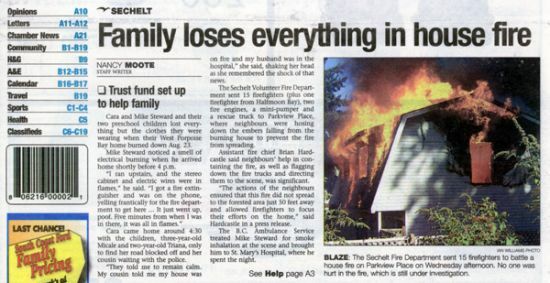 The story of our house fire was, of Course, front page news for the Sunshine Coast - someone even had a spectacular photo (must have Beat me to it) but all that is fine and was to be expected. What buggs me is that they wrote a two page story and never even contacted me, in fact they completely spelled Kellei´s name wrong (Kellei is my fiancee for those that are new here) - Here´s a link to the article http://www.coastreporter.net/ but it will probably only be there for a week. It´s not like I feel our loss was more significant then the Stweards, but we did just loose our house - they could at least have given us a chance to tell our story - or even bothered to call and Check that they had the right name.